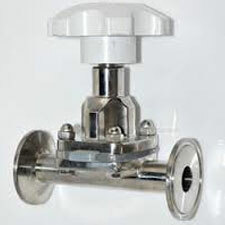 AMTECH DIAPGRAGM VALVE TC END is recommended for pharmaceutical , water treatment and other application. The Body material is SS 304,SS 316,SS304L ,SS316L.These Tri clover end (TC end) with mirror finish and with diaphragm special grade for pharmaceutical. The sizes of Valves are 1/2" -2"